Sometimes the needs of the day mesh nicely with the desires of the spirit. A little over a week ago that happened for me. 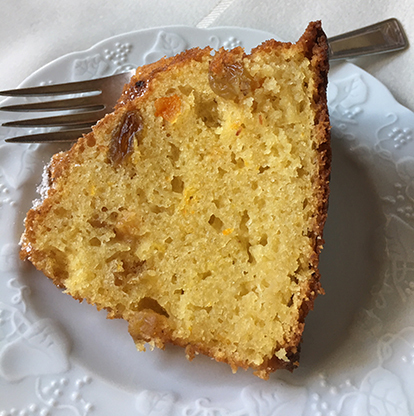 I wanted to make this luscious sounding pound cake as my choice of this month's challenge recipes for the Cake Slice Bakers. That was the desire. The need was unexpected; a dear friend died unexpectedly and my scholarship group was asked to provide some of the food for the reception after the memorial service. So I baked the Austrian Pound Cake in a dairy-free version and took it to the memorial, where it was enjoyed and commented upon favorably. Phyllis was an amazing woman, born just before the Great Depression to a local family, raised with love and lots of extended family. She was college educated, wife and mother, business woman and volunteer, expert seamstress and needleworker, childhood athlete and super S.F. Giants baseball fan, amazing mother, wife, aunt, grandmother and great grandmother as well as friend, a club woman, including Red Hat Society, Model T Club, Graton Community Club and our own P.E.O. scholarship group. She always made each person she was with feel special, which is a gift. She demonstrated how life is when everything is done with love. She will be very much missed and would have enjoyed the cake! Other than swapping out margarine for butter and soy creamer for milk, I made this just as written. It is tender, with a delicate orange flavor, with delicious bits of apricot and golden raisin here and there, and with just a bit much oil I think. I would reduce the amount of butter called for by a few tablespoons, although not using real butter as I did might be the problem. It baked up very nicely in a Bundt pan. I recommend this recipe...it would be a really nice Easter treat. Follow our Facebook, Instagram, and Pinterest pages where you can find all of our cakes, as well as inspiration for many other cakes. You can also click on the thumbnail pictures below to take you to each of our cakes, or visit our blog where the links are updated each month. If you are interested in joining The Cake Slice Bakers and baking along with us, please send an email to thecakeslicebakers at gmail dot com for more details. The Cake Slice Bakers also have a new Facebook group called The Cake Slice Bakers and Friends. This group is perfect for those who do not have a blog but want to join in the fun and bake through this book. Spray a 9-inch (23 cm) Bundt pan with baking spray, or grease very well and flour. In a small bowl, combine the golden raisins and the apricots with the orange liqueur. Allow the fruit to soak up the liquid while you prepare the batter. In a large bowl cream together the butter and sugar and vanilla until light and fluffy, a few minutes. Add the melted white chocolate and then the eggs, one at a time, mixing well after each addition. Pour in the milk, but don't mix in. In a separate bowl, combine the dry ingredients: flour, almond flour, baking powder and salt. Sift these dry ingredient into the butter mixture bowl, then mix, just until combined. Fold in the raisin and apricot mixture and the orange zest. Transfer the cake batter into the prepared Bundt pan, smoothing the top. Bake in the preheated oven for 1 hour, or until a toothpick inserted into the thickest part comes out clean. Cool in the pan on a wire rack for 10 minute, then turn out and cool until barely warm. Serve warm with a dusting of confectioners' sugar. It looks delicious! I'm so sorry about your friend. My condolences on the loss of your friend—she sounds like an amazing person. 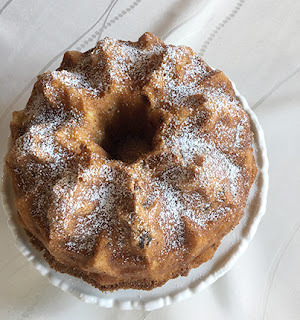 I’m sure your pound cake, baked with love, was a beautiful tribute to a life lived with love. So sorry for the loss of your friend. It sounds like she was an amazing woman. I love the pan you used and thanks for the tips on making it dairy free. It's a beautiful cake. Your cake come out beautifully. Your post is a true tribute to your friend.